All of these pieces are indeed sonorous. And to my ears beautiful. As I understand the notes accompanying this Kairos issue, Fuentes’s goal in these four works is to attempt the transliteration of the kinetic energy latent within objects, substances and physical states into musical form. If the music of Giacinto Scelsi challenges the listener to focus on the minute timbral changes within a single sustained note over extended time lengths, Fuentes uncovers the teeming life that exists betwixt and between these changes. I suppose both composers are trying to uncover ‘the music within music’ in very different ways. This is incredibly busy, astonishingly detailed music: the words ‘light’; ‘particles’ and ‘kaleidoscopic’ occur and re-occur in the notes, and give a good indication of what this music is like. The four pieces included here constitute an informal ‘quartet of quartets’, each exploring the life evolving from the impacts of specific physical processes on different types of matter. Thus the earliest piece Broken mirrors presents music that seeks to characterise the effects of a crack on the surface of a crystal. The microscopic sounds made by the individual players of the Quatuor Diotima may be exposed or may coalesce with each other. There are episodes of intense activity which meld into stasis or even silence. The music is never loud but the dynamic constantly varied within the quietness. One can only wonder at the ability of this Quartet to present such complex music with such apparent ease, lightness, even tenderness. In this piece they effortlessly induct one into the far-flung mysteries of Fuentes’s unique sound world. The textures in the following Liquid crystals metamorphose less abruptly on the whole, though there are some dramatic effects – the extraordinary sequence of stabbing gestures from the cello after about 6’10 for example – a sequence that generates a succession of sul ponticello sounds; but the essence of the music here is still overwhelmingly liquid; the crystals have melted. The gradual fragmentation of the sound toward the final ‘drips’ at the conclusion of Liquid crystals is satisfying and strangely alluring. “ That’s how the fabric changes its substance, transforming its flashes of colour, weight, brightness and perspective. Arpeggios, tremolos, circular bows, glissandi, sul ponticello and randomness place us against freer, multiple and edgy refractions as Ice reflection advances, spreading the sparkles in new directions.” ( I have to say that Julian Schoenfeld has made a decent fist of translating the helpful words of Spanish arts commentator Paco Yáñez – while this introduction is occasionally a little complicated it certainly avoids falling into a mire of pretentiousness). One is aware of a growing confidence in Fuentes’s writing for string quartet as one piece succeeds another; Ice reflection is the most refined work to this point, and the Quatuor Diotima make light of its challenges. The final piece, Glass distortion, is also the most recent, and at roughly twice the length of its predecessors the most ambitious, especially as it also incorporates electronics which are both stunningly realised within the recording and appealingly seductive to the ear. Here the ‘glass’ is realised as literal sound, as the eerie tones of a microtonal glass harmonica, consisting of 24 partially filled glass vessels is in turn ‘converted’ into string quartet music, and electronically processed to provide an accompanying aural halo. The composer has described his use of electronic processing throughout his oeuvre as an ‘acoustic veil’, which is a particularly apposite description of its role in Glass distortion. Moreover the techniques and strategies he has applied successfully in the first three quartets on this disc are convincingly distilled and synthesised in the fourth. I feel it would be wrong to simply categorise this music as ‘spectralist’- Fuentes is after all microscopically subjecting phenomena to analysis that goes far beyond the properties of sound. The products of these experiments are both formally convincing and sonically appealing. Excerpts from the score are reproduced in the notes. They appear to indicate music of considerable complexity, but the sound world that prevails often betrays a lightness of touch redolent of Salvatore Sciarrino. The performances of the Quatuor Diotima appear definitive; they have been impeccably prepared and are drenched in a conviction rare for new music. The recording is ideal, especially the integration of electronics in Glass distortion, which is superbly managed. 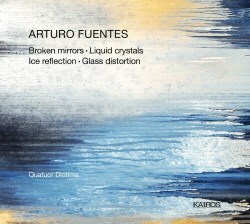 Hats off to Arturo Fuentes and to Kairos - I earnestly hope this review will prick the curiosity of readers not normally attracted by challenging contemporary composition – this music is far from forbidding and is frequently profoundly beautiful. I believe their sense of adventure will be amply rewarded.